God sometimes gives signs to show people the right way. Have you seen signs to guide you through life? Some signs can be subtle and hard to notice. Other signs are obvious, maybe even frightening. Regardless, when we really want to know God’s will, we grow when we respond to the Holy Spirit’s leading with obedience. Today, I want to focus on understanding what God wants from you. Suppose he has given you a sign. How do you interpret it? How do you understand what it means? 16 Herod was furious when he realized that the wise men had outwitted him. He sent soldiers to kill all the boys in and around Bethlehem who were two years old and under, based on the wise men’s report of the star’s first appearance. Joseph received a clear message from God. God sent an angel to warn him in a dream to flee to Egypt with Mary and baby Jesus. If we accept what the scripture says, there weren’t any symbols to interpret. Joseph didn’t have to struggle with what the dream meant. There was another Joseph—in the Old Testament in the book of Genesis—who also had dreams. That Old Testament Joseph’s dreams were strange and full of symbolic meaning. Do you remember? There was one dream in Genesis where the sun, moon, and stars bowed down to Joseph. It was a symbol of how Joseph’s brothers—along with all the known world—would one day bow down to Joseph when he became Pharaoh’s second in command. But the Joseph in our story this morning—Jesus’ earthly father Joseph—had a different kind of dream. It was much clearer. “Get up right now and run away to Egypt! King Herod is trying to kill the baby Jesus.” No symbols there. The meaning is plain and urgent. Sometimes God comes to people in a dream. People have dreams all the time. Usually, there’s nothing to them—just random synapses firing in the brain while we sleep. But when God comes to you in a dream to give you a sign (or in any other way), you will know it’s something special you need to pay attention to. If God wants you to get the message, you’ll be left with the distinct impression that this dream (or sign) is something important to which you should pay attention. If you’re the kind of person who goes through life dismissing God’s voice—“Oh come on! God doesn’t speak to people. I don’t believe in all that superstitious nonsense..."—you’re probably not going to notice when God speaks to you. But if you believe God can and does speak to people, and you make a life-long practice of asking Him for direction, listening intently for the Spirit, and obeying when He speaks, you will notice when God sends you a clear message. Do you realize, Joseph was a godly man? He didn’t just wake up one day with the ability to hear God’s voice. His whole life, Joseph was practicing and preparing his ‘God-ears’ to hear God’s voice. Matthew 1:19 tells us Joseph was a righteous man. That means he trusted God. He worshiped God. He prayed to God. He had a relationship with God. He went through life listening and trying to obey God. So when God came to Joseph in a dream, Joseph already had the ears to hear. What about you? Do you trust God? Do you worship God? Do you pray to God? Do you have a relationship with God? Do you read the Scripture? Do you believe God can and will speak to you? Do you try to listen to God and obey? The more you do, the more sensitive your ears will be. But that's not what most people want, is it? We would rather God only speak to us when we have a question or when we want something. Then, once we get what we want, God can just go get back in His box and be quiet. We'll call Him when we want something. What is that?!? We've got it backwards, I think. God is the Creator of the universe. He created us, not the other way around. We don't get to tell Him when and when not to speak. Nor should we want to. We should count every word that comes to us from Him a blessing and a privilege. We should be at His beckoning call. But we are sinful, selfish people and so we've got it all mixed up. Let me give you some important advice about interpreting God’s signs. If you see a little something that might be a sign from God and it encourages you, just accept it. Don’t question it. Be encouraged. 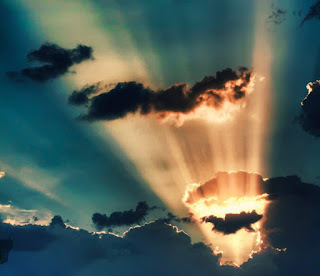 For example, if you’re driving home from work and you see the most beautiful cloud formation in the sky and think, “Wow! It’s almost like God painted that just to tell me He loves me.” Well, maybe He did. (God does love you, so you can be sure that's true.) Maybe it wasn't really a sign from God, but what’s the harm in just accepting that it might be? I mean, God does love you and we’re not talking about selling your house and moving to China here. We’re just noting the wonder of God’s creation and getting a little encouragement. So why question it? Just accept it! It’s a small sign. Give it the benefit of doubt. This can apply to bad feelings too. Suppose you are out late at the gym and it’s dark outside when you get done. You go to walk out to your car to go home (like you do every other night in December), but you get this ominous feeling like maybe you shouldn’t walk to your car alone tonight. I say: trust your instinct. Maybe God is trying to tell you it’s not safe out there tonight. Maybe you should wait inside until someone can walk you to your car. What’s the harm in just accepting it as a sign from God? Again, we’re not talking about selling your house and moving to China here. All that’s at stake is a few minutes of your time and maybe asking someone for help. Now if you are having persistent feelings of doom and gloom, fear, depression, paranoia, distrust, etc. that are going on for weeks at a time, I suggest you talk it over with an experienced and trustworthy Christian friend. God doesn’t want us to go through life afraid and paranoid. If we are, there might be more going on we need to address. The point is, the potential consequences the sign has on your life is important in how seriously you take it. If it’s just a small thing, just accept it and thank God for it. However, if the sign is pointing you toward a really important decision that will have lasting consequences, you ought to take a little more care in understanding it. Let me give you 4 tips that can help you discover what God Might saying to you. Tip #1 - Talk it over with a spiritual advisor. If you feel like God might be trying to tell you something, talk to a trusted Christian friend, family member, Sunday school teacher, or pastor. You may even want to discuss it with a professional Christian counselor. These are people who can give you insight about what God might be saying (or if it's God speaking at all). They can also encourage and give you support. When I felt God was calling me to be a pastor, I talked with several people over a period of time: my mom, by best friend, my wife, and my pastor. They helped me understand and verify God's call and it just made me feel better to have people I trusted walking with me on that journey. Even now, after years of experience walking with God, I still practice my own advice. I talk to people about what I think God might be saying to me. It is tremendously helpful (essential really). Tip #2 - Ask, " Does what I think God is telling me match up with the Bible? The Bible is the foundation of what we believe and the last word in everything we do. God gave us the Scriptures to guide us and He's is not going to ask you to do something contrary to His own Word in the Bible. In South Carolina in 2012, Tammi Estep stabbed her husband. She said she did after, "Jesus and Mary told me to kill him because he is Satan's spawn! "[i] Well, how many wives have not thought there husband's were the spawn of Satan at one time or another… Seriously though, God is not going to tell you to murder someone. Nor is He going to tell you to do something that contradicts what He's already said in Scripture. If you feel He is, I would point you back to Tip #1 - Talk to a spiritual advisor. Tip #3 - Does the sign intend to lead you or others closer to Christ? The Great Commission from Jesus to His followers is: "Go therefore and make disciples of all nations, baptizing them in the name of the Father and of the Son and of the Holy Spirit…" (Matthew 28:19 ). This is our mission. Remember, life is not about you. This isn’t the story of your life. This is God’s story and you are just one actor in the movie. You don’t even have that big a roll. So remember, if God is talking to you--directing you in some really important matter that will have life-long, lasting consequences--it will probably be linked in a large way to leading you or others closer to Christ. If it isn't, if it's linked more to you own self-centered interests, it's more likely not God speaking to you. Either way, I would point you back to Tip #1 - Talk to a spiritual advisor. Tip #4 - Ask the Holy Spirit to verify it for you. It's OK to ask God to help you be sure. People did that in the Bible many times. There was even a man named Gideon in the book of Judges who made a kind of experiment. God sent an angel and told Gideon to go fight some people who kept raiding Israel. Gideon asked for a sign to verify it. He said, "I'm gonna lay out a piece of wool fleece on the ground. If there's dew on the fleece in the morning, but not the ground, I will know You were speaking to me." And in the morning, there was dew on the fleece and not the ground. But Gideon wanted to be sure, so he repeated the experiment, but this time he said, "Alright. If it's really You, this time there will be dew on the ground all around, but not on the fleece." And it happened just like that! In the morning, there was dew on the ground, but none on the fleece! So Gideon knew it was God talking to him and he went off and defeated his enemies. It's OK to ask for a sign to be sure it's really God speaking to you. But some might point out what Jesus said in Matthew 12:39, “It is an evil and adulterous nation that looks for a sign. No sign will be given…” Jesus' frustration in that instance was with those who had already seen sign after sign after sign that proved Jesus was indeed the Son of God. He'd healed the blind and deaf, made the lame to walk, walked on water himself, and even turned water into wine. What more would it take to convince people? Enough signs had already been given. Some people didn’t want to believe and so they just kept asking for more signs. Then they would pick apart every sign given with sinful cynicism. They weren't going to believe no matter what Jesus did. So you can ask for a sign, but once you know God is told you to do something, it's time to act. We probably all have had times we knew what we were supposed to do, but didn't want to do it. Don't keep asking God for signs as an excuse to put off obedience. Get busy. And, oh, did I mention you should see Tip #1 - talk to a spiritual advisor? You should. Have you been listening to God? Have you been exercising your spiritual ears? Have you been trusting Jesus? Have you been praying? Have you been reading your Bible? Is it time for you to start today? What has God been trying to say to you? Has He been nudging you? Has He been shouting? Have you been ignoring Him? Do you need to talk to a spiritual advisor—trusted Christian friend, family member, or pastor? Is it time to “Get up and go” do what God’s been telling you to do? What’s stopping you?